Do you have a busted laptop, camera, fax machine, or LCD projector at home that you want fixed but you simply have no time to bring them to a service center? 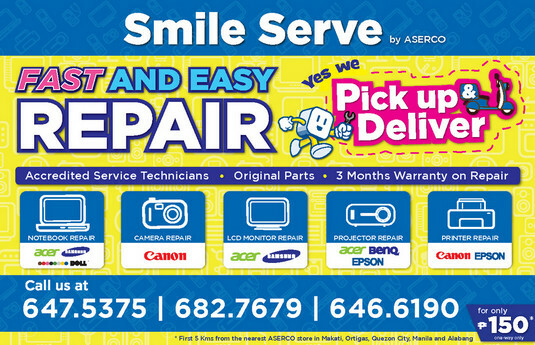 Well, City Delivery and ASERCO know just how busy you are, and with their new partnership (that you might want to try out), you won’t have to deal with all the inconveniences that come with having your home and office appliances and gadgets repaired! They will work around your schedule and most convenient time for pickup and delivery of your devices. One of City Delivery’s visions is to be a one-stop delivery service of convenience and dependability. They started to bring the best of what Manila’s premium restaurants has to offer which extended by partnering with home-based merchants and opening their doors to other types of deliveries such as flowers, medicines, groceries and the like. As part of their innovation, City Delivery is proud to announce that they are now the logistics arm of Affiliated Electronics Service Corporation (ASERCO)—the authorized service center of big appliance centers such as Abenson, Electroworld and WalterMart. Equipped with trained technicians, ASERCO repairs and services major home appliance brands you know and trust. Among the brands are Canon, Epson, Panasonic, Acer, Samsung, BenQ and Sharp. It's so easy to enjoy this great service. 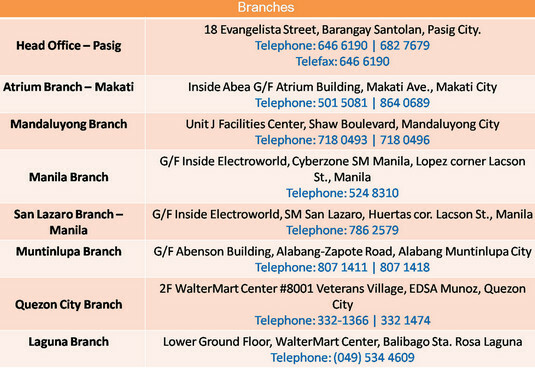 Basically, you just need to give an ASERCO branch near you a ring and book the pick-up and repair. The minimum pick-up cost is Php 150 for the first 5 kilometers plus an additional Php 38 for every succeeding kilometer; That's for pick-up via motorcycle. 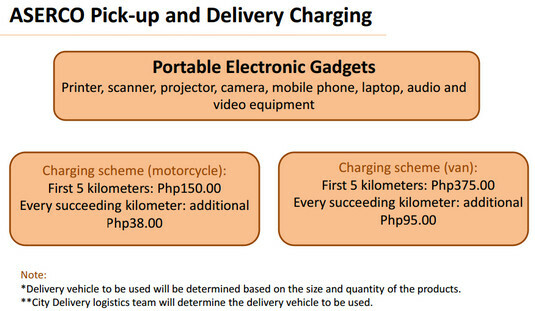 If your gadget is too big and City Delivery has to pick it up using a Van, it will be Php 375 for the first 5 Kilometers plus Php 95 for every succeeding kilometer. The same rates apply for the delivery of the repaired device. 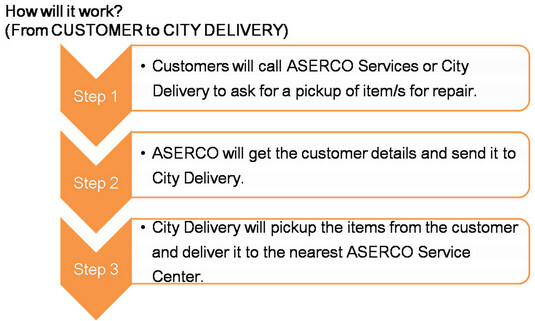 City Delivery will pickup the items within 2 hours upon receiving the order from ASERCO. Don't forget to sign and get an original copy of the checklist from the City Delivery staff who will pick up your device. You'll also have to pay the pick-up fee in cash up front. Then, give ASERCO enough time to find out exactly what's wrong with your gadget and to come up with the total repair cost. Expect a call from ASERCO regarding the total fee and if you're OK with it, they'll proceed with the repair. As soon as the device has been fixed, they'll call you again to schedule the delivery. TP Friends, with the combined expertise of City Delivery and ASERCO, having your gadgets fixed is finally as easy as turning them on! For more information, feel free to call ASERCO at 647-5357, 682-7679 or 646-6190 or you may give City Delivery a ring at 87878.